Heavy loads don’t have to be burdens if you have the right equipment. Imagine tree branches downed in a storm. They’re miserable to clean up, but a log splitter can break them down into firewood, and a wood chipper can chop them into mulch. Your biggest obstacle to claiming that windfall is trying to figure out how to lug all that wood across your property. We’re not limited to talking about wood when it comes to heavy loads, either. Large amounts of soil or gravel can transform your home landscaping into great-looking grounds – but only if you’ve got the proper equipment to haul that material. A regular wheelbarrow can help. However, a regular wheelbarrow moves forward only when you push it, which can leave you exhausted before the real work on your project has even begun. Plus, the single-front-wheel design of many manual wheelbarrows can make balancing a heavy load difficult. There's a safer, more powerful option. Power wheelbarrows, also called power carts, are an innovative weapon in the yard care arsenal. When you have heavy loads to haul but don’t have the space to tow them with a riding mower and utility cart, a power wheelbarrow is your best bet. Power carts allow you to move those loads quickly and efficiently, with less strain on your body, and have a number of features to help them do it. What Can Power Wheelbarrows Carry? The feature that most people focus on when it comes to wheelbarrows is the tub, or hopper, and for good reason. This is the part that holds the load you need to carry, so making sure that your power wheelbarrow has a sturdy hopper is essential. How Are Motorized Wheelbarrows Powered? Without power sources to drive them forward, these tools would be simple wheelbarrows – helpful, but not as effective at handling rough terrain or reducing the force you need to push them. 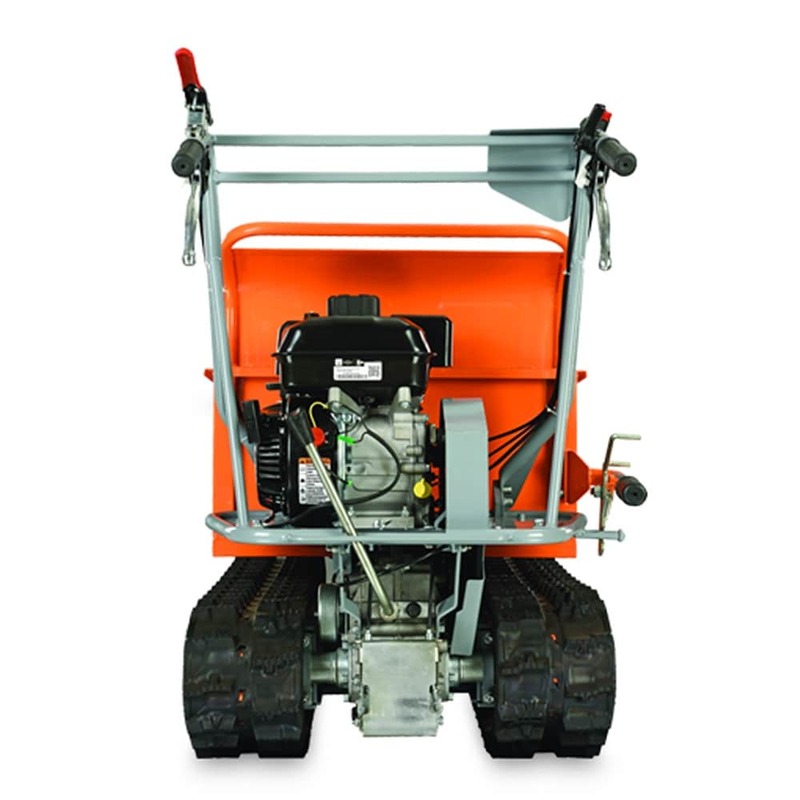 The most rugged motorized wheelbarrows derive their power from gas engines. 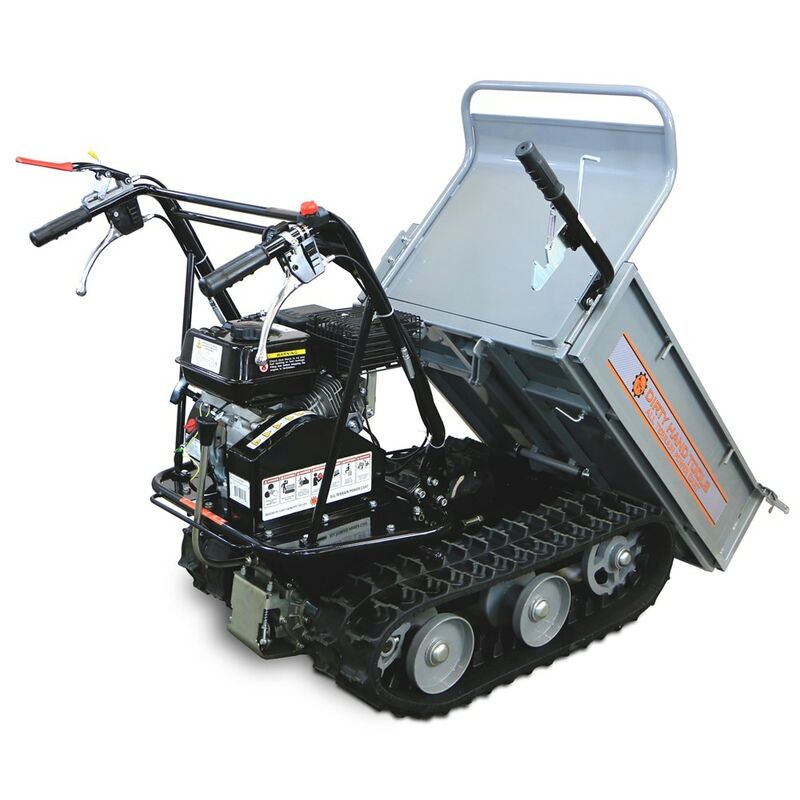 Thanks to powerful engines from well-known manufacturers such as Briggs and Stratton, these carts can cross uneven ground and slopes up to 20 degrees (depending on the model) with little effort from the user. Often these engines are coupled with transmissions that feature forward and reverse-gear settings, so that you can move your gas-powered wheelbarrow in any direction. 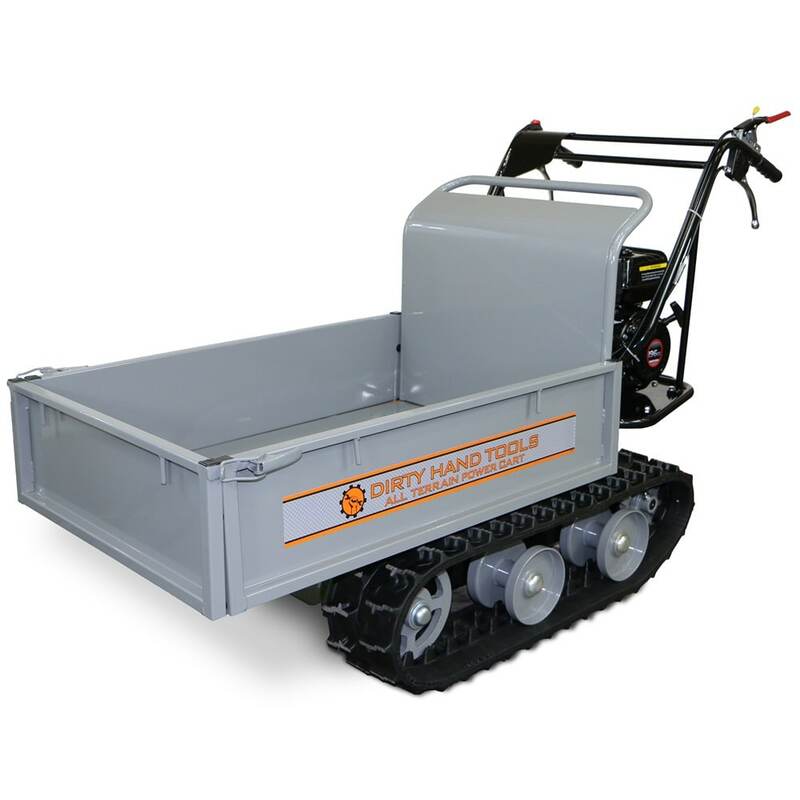 For those interested in power carts that need less maintenance, some manufacturers produce electric wheelbarrows. These are often lighter, with lower weight capacities than gas-powered models. What Kinds of Wheels Do Power Carts Use? A robust engine wouldn’t be useful on a wheelbarrow that couldn’t move. But what if you found out that some power wheelbarrows don’t have wheels? It’s not a riddle. Instead of traditional wheels with tires, some gas-powered wheelbarrows use track drive technology, earning them the name trackbarrows. The tracks rotate around smaller wheels and keep in contact with the ground. Not only do track drives provide a smooth ride over rough, rocky ground; they also provide additional traction on hills and slopes, just like they would on a tank. However, for those who prefer traditional wheels on their wheelbarrows, manufacturers provide those as well. The tires on traditional wheels are often pneumatic, meaning that they have a rubber tire body that’s excellent for shock absorption fitted onto a metal hub. Smaller power wheelbarrows (in particular electric models) might have rear caster wheels not attached to an axle. These allow for maneuverability while keeping the wheelbarrow light. No matter which style you choose, you’ll find your power wheelbarrow much easier to steer than you might have expected, given its weight. On many models, steering is as simple as pulling a handle or trigger, which can give you a zero turn radius that’s perfect for negotiating tight corners. How Do Power Carts Deposit Their Loads? 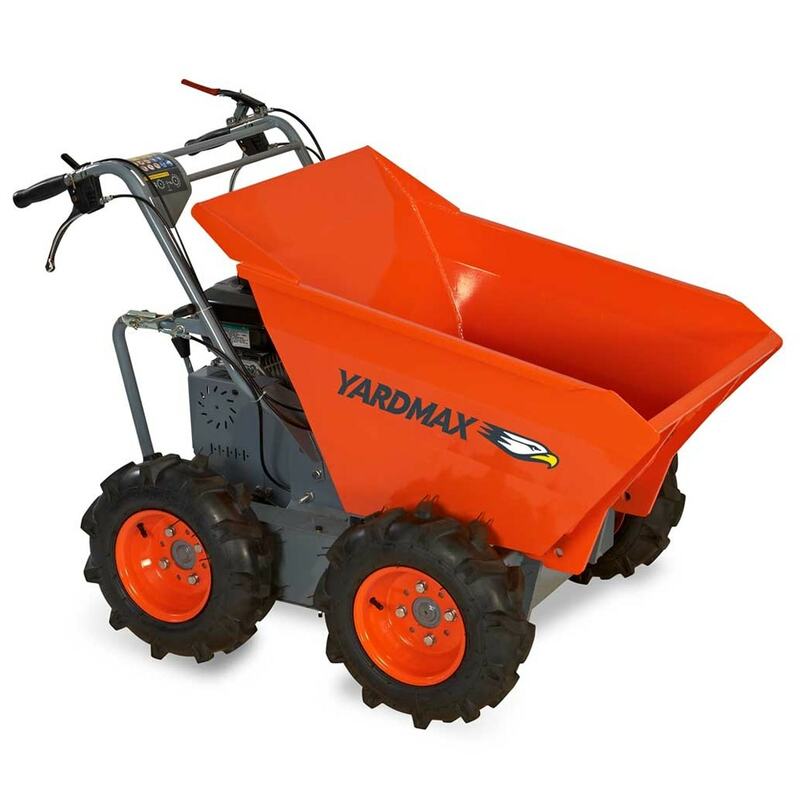 Aside from not needing a riding mower or ATV to tow them, power wheelbarrows offer another convenience that you’ll get from dump carts but not from utility trailers: the ability to deposit their load wherever the user directs it. In order to dump a load out of a standard, non-motorized wheelbarrow, a user needs to tip the entire wheelbarrow. Not only does this require some strength; it can be imprecise if the weight of the load makes the wheelbarrow difficult to maneuver. Power wheelbarrows take this strain off the user by employing hoppers that tip independently of the rest of the machine. To deposit a load from a power wheelbarrow with a manual hopper, all a user has to do is simply lift a handle. The hoppers on many power carts are designed with a center of gravity that makes tilting even the heaviest hoppers easy. If you have a lot of material to transport across a large swath of land, don’t think it will be impossible to do without a vehicle and a tow cart. Power wheelbarrows put all the strength you need to move logs, wood chips, gravel, and more right in your hands. 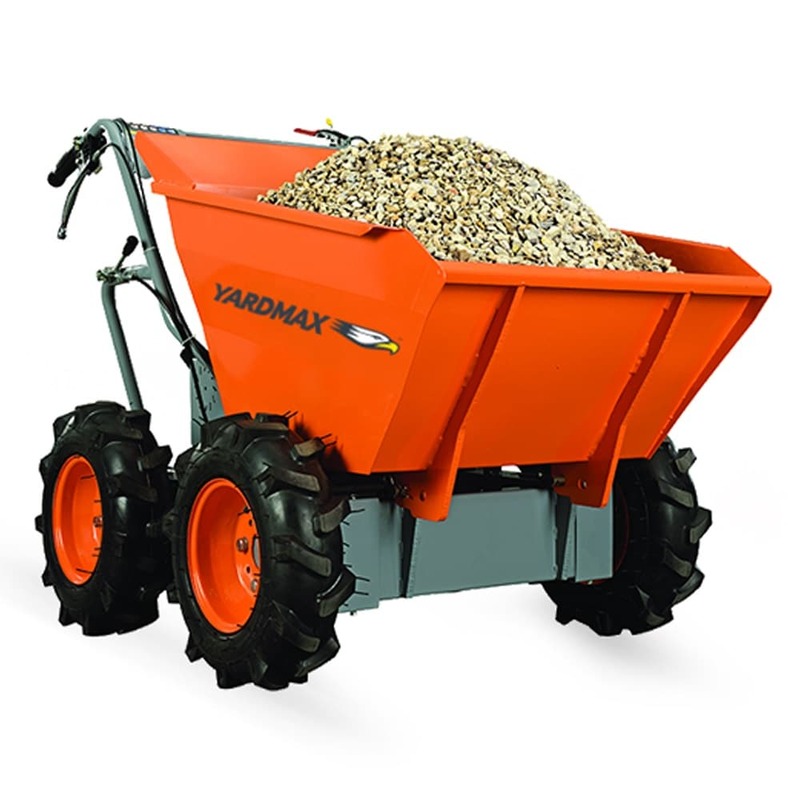 Power Wheelbarrows 101 - View Our A Guide to Power Carts and Wheelbarrows. Our chipper shredder how-to library can help you pick the perfect electric chipper shredder, gas chipper shredder, pto chipper shredder or chipper shredder vacuum.